At a Special Court of Oyer and Terminer and Jail Delivery held at Corydon in the County of Harrison on Monday, the seventh of March, 1814, 18 men found themselves cast into a role they would not likely have held, at least not often, before that date. 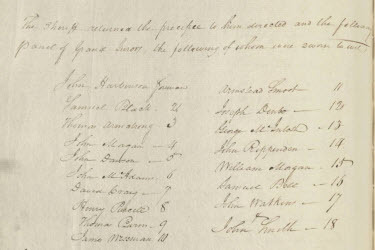 The names of the 18 men, and their roles in the fledgling judicial system of the territory in transition to statehood, were inscribed in a unique set of records now digitized and available for study online. The cases included in the records are both civil and criminal — this particular oyer & terminer session was a criminal session of the Indiana Territorial Court4 — and the records and the entire website are well worth a close look. That’s true even if the only time a person of interest shows up is in a single jury list. Because being in that jury list — by itself — tells us something about those 18 men. So… what do we know about John Harbinson, Samuel Black, John Armstrong, Thomas Morgan, John Dawson, John McAdams David Craig, Henry Purcell, Thomas Burns, James Wiseman, Armstead Smoot, Joseph Denbo, George McIntosh, John Rippenden, William Morgan, Samuel Bell, John Watkins, and John Smith — the men of the March 1814 Grand Jury? They were all men. All white. Voters, or at least qualified to vote. All over the age of 21 and, likely, even though the law itself didn’t yet say so, under age 60. They were taxpayers and freeholders — in other words, property owners. And recorded, forever, in the pages of the order book of the Clerk of the Court of Indiana Territory. A thoroughly grand sight, on a thorough grand website, for Indiana research. Thanks for link to this website! I experimented with the box that shows “keyword search” and discovered that if I enter the word “fine” (without quotes), documents entitled “Grand Juror Absent” were displayed. These docs give names and fine amounts for people who incurred a fine. One was a man whose surname was Snapp who incurred a fine for not appearing for jury duty. I went back to the “keyword search” box and entered the words “fine Snapp” (without quotes) and it returned the one document with the fine for Mr. Snapp. Pretty cool! Glad it’s working well for you!